October 17, 2013 - A Southwest passenger boarding (operations) agent, Jennifer Patterson, filed a lawsuit against passenger, Christian singer and songwriter Natalie Grant (Grant-Herms) alleging the singer tweeted and placed false and defamatory statements on Facebook. 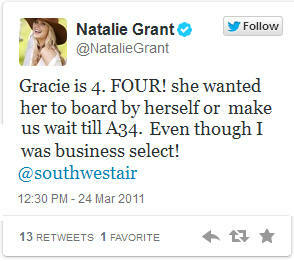 On March 24, 2011, Grant was to board a flight from Nashville to Denver. While standing in line to board the flight, boarding agents were checking passenger tickets and then allowing passengers to board the aircraft as they cleared each passenger. Grant was standing in line with her husband and three children. When the boarding agent, Jennifer Patterson, checked Grant’s tickets and noticed Grant did not have tickets for two of her children and her husband, the agent informed Grant that she could not allow those without tickets to board the flight. Grant was only allowed to board the flight with one of her children. After boarding the flight, it was alleged that Grant made several defamatory statements to the flight crew, including that the agent told her to "stop flying Southwest," and "get over it." The suit also alleged that Grant took to her twitter account venting her anger to her 187,000 Twitter followers, Facebook and the carriers website with the following statements. i. "Gracie is 4. FOUR! she wanted her to board by herself or make us wait Till A34. Even though I was business select!" ii. "I fly @southwestair at least 75x/year. just had WORST experience. Me; A1, Sadie: A3 Gracie A34. Woman refused 2 let Gracie board w/ me." iii. Defendant tweeted: "Nashville. Gate A25. Flight to Denver. Her name is Jennifer. She said "get over it. Follow the rules. Or don't fly." iv. She has done this to me before. She has the WORST customer service. My daughter is FOUR. v. She re-tweeted: "that is ridiculous! [W]hat did she expect? Her walk on herself & find her seat like a grown adult?" vi. "If your [sic] sympathize with me, when you respond be sure & include @southwestair in tweet. They need to know this WRONG." vii. Sadie had MAJOR blowout. I think it's in response to our southwest air experience. She decided to leave them a gift on their plain. Teehee. Asked me what they can do. I don't want free flight. Just apology from Jennifer. It's 4th time she's done it to me. Time will tell. viii. Well, we've caused quite a stir, tweeps. @southwestair just called me. I appreciate their concern & prompt attention 2 the problem. ix. I've got wifi on my flight. I'm impressed with how quickly @southwestair responded to my complaint. I'll keep u posted as to what they do. A Tennessee Circuit Court granted Gant a summary judgment and ruled the statements did not rise to the level of defamation, that the language could not be construed to hold the agent up to public ridicule, and that the language was not highly offensive to a reasonable person (PDF of the original suit). However, Nashville, Tennessee Court of Appeals Judge Richard Dinkins after a careful review of the case reversed the Circuit Court’s summary judgment and remand the case for further proceedings in accordance with this opinion (PDF of Court of Appeals).